Ngenea HSM is an extremely fast, highly scalable, data management layer unifying IBM Spectrum Scale (GPFS), cloud and third-party storage into a single GPFS global namespace. Ngenea HSM transparently tiers files to external storage freeing local storage space. Applications and users see an extremely cost-effective standard POSIX file system (GPFS, NFS, or SMB) within their existing namespace no matter where the data is stored, with no change to user or program access. Files are accessed directly from high-speed IBM Spectrum Scale storage as needed. Ngenea HSM performs both automated or manual migration of files to storage endpoints. 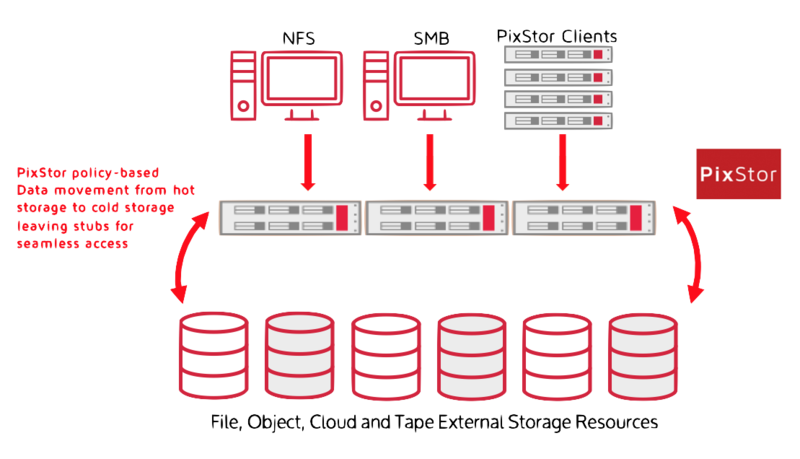 Migrations can trigger when storage capacity crosses a defined threshold or on a scheduled basis. Command line utilities provide the ability to manually manage datasets as required. Files are recalled when accessed by applications. Ngenea HSM transparently intercepts the generated file open request and performs the task of retrieving the object from its associated storage endpoint. Ngenea HSM can perform targeted singular or multiple file retrieval from a storage endpoint. File recall can be driven via the GPFS/Spectrum Scale Policy Engine or via command line utilities. Ngenea HSM supports Spectra S3 Bulk GET and Spectra S3 Bulk PUT, ensuring the fastest operation with Spectra Logic BlackPearl systems. Ngenea HSM is a fully certified Spectra S3 client. Upon migration to a target, Ngenea HSM retains the full file path and filename. This capability provides the ability to read data from the storage endpoint at other locations, providing a seamless file delivery workflow. Ngenea HSM can store files in (and recall from) different storage targets, based on a data management policy or simply selecting by file path or file name.